Dr. Lynch: Grave Secrets is rated 3.6 out of 5 by 10. Rated 5 out of 5 by Zurreen from Fun & Easy I must confess I had my share of doubts by the very name of the title character, "Dr. Lynch," and seeing him as the story began did not help much. It didn't take long, however, before the game turned out to be a real pleasant surprise. In fact, I was so intrigued, I had to play it all the way to the finish, taking few breaks in between. The storyline is really good. It starts off with a ghost sighting, but soon develops into a real murder mystery. 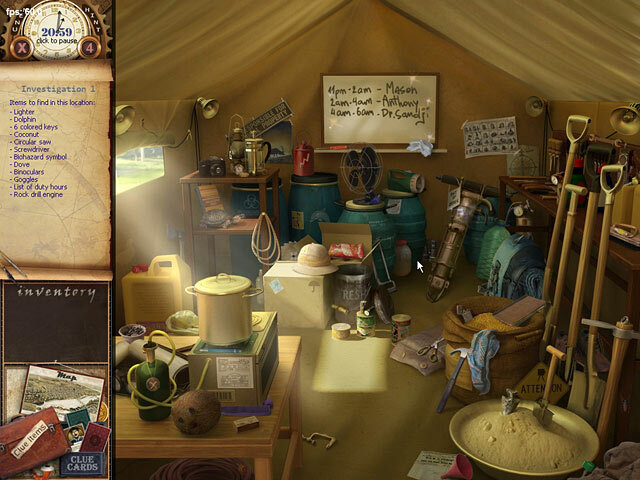 The game itself is divided into fourteen chapters, which consist mostly of hidden-object (HO) scenes. There are no cut scenes between chapters. Instead, you get a comic-strip sequence. But the HO scenes themselves are nothing like that, and are more like real-life photographs. Thus, you should have no difficulty solving those scenes, at least in this respect. I have qualified my remark about the HO scenes for two reasons. First, I should tell you that all the HO scenes are timed. That might daunt some players, but it really shouldn't, because you do get plenty of time per chapter. Second, I should also tell you that the HO's are often quite small and difficult to spot. But, again, there is no need to worry because you also get plenty of hints per chapter. What's more, you can add some hints yourself by finding some optional items. Note, however, that even though the developers call them "optional," I don't think you can skip these items; and you don't get any hints for finding these particular items either. But the worst that can happen is you run out of time and would have to start just that chapter once again; and, believe me, it goes a whole lot faster the second time around! In addition to the HO scenes, there are a few puzzles in the game. But they are all quite easy, and none of them are timed. You can also SKIP them altogether, if you like. Finally, I would suggest you check out the HELP section in the Main Menu. Mind you, this is not your run-of-the-mill HO game, in which you just go blindly finding HO's, paying little or no attention to the storyline, usually because there is hardly any storyline worth the attention at all! In contrast, this game has a very rich storyline, and it even gives you things like Clues and Clue Cards to reinforce the information you collect, allowing you to refer to all this information any time you like, and does not time you either on such references. So it would be a good idea to check out the HELP section, because it basically tells you everything you need to know to get the most enjoyment out of the game. In short, this is really quite a fun *and* easy game, which I hope you will enjoy as much as I did. Rated 5 out of 5 by agreyowl from Solid Gameplay Like one of the other reviewers, this was among the first HOG games I played, and like that reviewer, I've also bought it twice because the company I originally bought it from couldn't replace it. This is a great game. It might not be at quite as flashy as some of the newer HOG games, but it has an interesting story and fun gameplay. I think the scenes are what really stood out to me, though. I felt like I was in actual place and really enjoyed spending time on most of the scenes. The sound effects created a nice ambiance, as well. I didn't think the objects were overly hard to find -- hard, yes, but not overly so. I think it's an enjoyable difficulty, for the most part. I did it without a walkthrough, and it provided a lot of challenging gameplay. It felt longer than the average HOG to me. At the very least, play the trial version and see what you think. It's a solid game. Rated 4 out of 5 by coffeyfan77 from The Secret Is Out Dr. Lynch has been out for quite some time, but as I revisited the game (which I played for the first time way before reviews were being posted), I thought I'd share my thoughts. I am a big fan of this genre, and it combines the look and play of the Agatha Christie series with one of my favorite developers, Jane Jensen. Anyone who has followed her career knows she is big into character and storyline, both of which are on display here. You play a renowned "skeptic" who is called to investigate odd goings on involving a dig site and a haunting. Naturally, things are more than what they first appear, and you'll navigate through about 25 "chapters" collecting objects and gaining information from the large number of suspects. Gameplay is repetitive but fun, and the town and folks in it are very realistically done. It's clear a lot of work went into the creation of this environment, and it mostly pays off. As with any game that's of a certain age, it suffers on the technical side. There are no voices, music is okay at best, and animation is reserved for cartoon strip cut scenes. The largest issue is the items themselves. While the areas you explore are realistic and look great, the things you're asked to find can be tiny and very well hidden. The use of hints should correct any major issue, but it's a problem at times. The minigames are a bit forced, but I did like the puzzles found within scenes where you repair things, etc. The game does not always make clear exactly what you need to do, which is a good call when your character is supposed to be smarter than everyone else anyway. By the time you've wrapped up the mystery #doesn't matter if you reached the same conclusion yourself#, you're invested in the characters and the endgame is reasonable and true to form. It won't win any awards for looks, but it's a solid entry to the genre and a great opportunity to delve into a fun case. Rated 4 out of 5 by LoneCleric from A Decent Investigation People familiar with the James Patterson series will quickly notice that this game uses the same engine (and even reuses some of its visual / sound effects). Unfortunately, the game's mystery isn't on par with Mr. Patterson's. It remains entertaining enough for a recommendation, but not much higher. Gameplay-wise, the game is a mix of hidden-object search, coupled with some side puzzles and some basic inventory management. Some of the objects you'll find count as clues, while completing a location always provide you with a new "Clue Card" telling you a bit more about the story. Some locations also have optional tasks. Performing those will provide you with more HOG hints. Rated 4 out of 5 by Mrs_Kim from Harsh but enjoyable I bought this game because I like its similar games by Floodlight like James Patterson and Agatha Christie. I know their style of HOG games which are tiny items put into a scene, but they're so realistically drawn that I really don't mind much. On the demo I can finish till Investigation 4 that I assume it won't be too much difficult although there is only one mode, that is timed game. As the game progressed, it's getting more difficult, as the time given is the same (25 min) but the location is more. I feel this game is harsh since we dont get any other option except being timed, and we also have to find optional item, but we dont get any hint. And when we exhaust all the hint, we can't get anymore that we are left in the dark, and tried to find the tiny items among the pile, even as small as a dot also count. The game is rather long as I used up almost all of the time given. However when you finish the game, there's some sense of achivement that you can go through all those things. I still tnk this game has a replay value. I will definitely play this game again after some time. If you like challenges in HOG, this game is for you. Rated 4 out of 5 by harveysmum from I like this game - I bought it twice! This was one of the first HOG games I ever played, so my experience level was low. I found it very challenging and I didn't know about walkthroughs. I got through it anyway and replayed it many times because it was the only HOG I had . The story is entertaining and plausible, the mini-games lend to the story, and the mystery is fairly good. The graphics are not MCF quality, but I didn't think things were as hard to find as Coosto did. When my computer crashed, I bought this game again from Bigfish when the company I originally bought it from couldn't replace it for me. Rated 4 out of 5 by ninotchka39 from Nice game I found it enjoyable - the levels increased in difficulty somewhat, and the storyline was entertaining. I enjoyed playing this game. 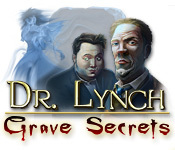 Rated 3 out of 5 by pennmom36 from Dr. Lynch: Grave Secrets I was expecting an adventure game within a cemetery, instead I got a cartoon comic strip of dialog to explain the Dr. Lynch is a skeptic who debunks just about any mysterious story. To make matters more disappointing, the locations that you search for hidden objects, are bright cheery and sunny scenes. 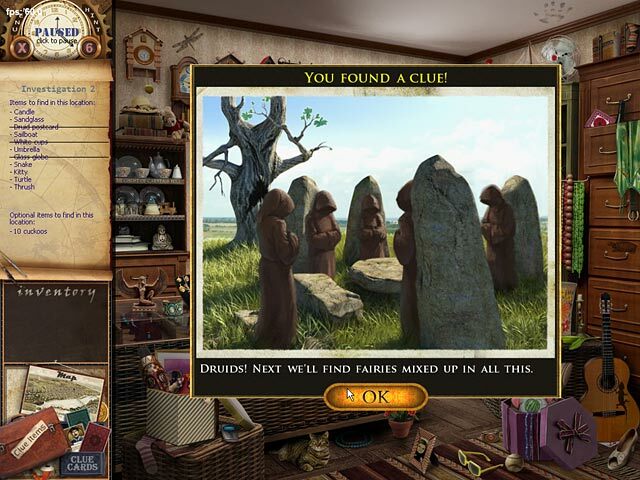 You choose which area you want to search in such as the dig site, and then you will be transported to that scene where a Hidden Object list will appear as a list form. If you use a hint to find an item, the next HO will allow you to earn another hint with an optional quest, such as 6 cuckoo's which need to be clicked on as soon as they pop out of one of the clocks in the scene. 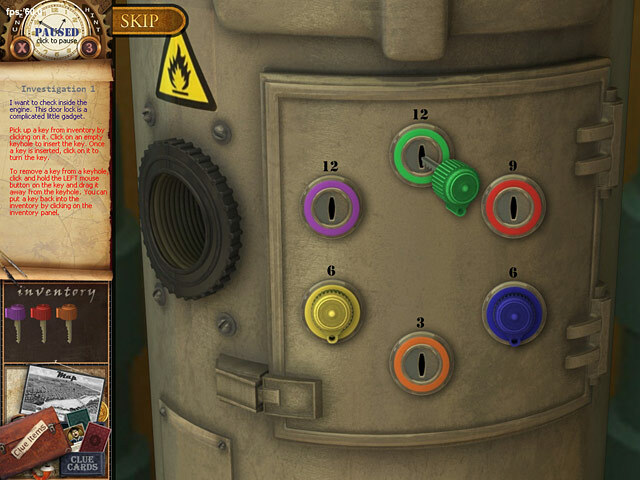 There will be clues you will come across that will be stored in Dr. Lynch's briefcase so that you can review the evidence at any time (which also stops the HOS timer) You will collect Clue cards with information about each character you meet as well. There are mini games and puzzles to complete, simply but fun, collecting color coded keys and placing them in their color coded keyhole, then using the number clues you set each key at either the 3-6-9 or 12 position. This isn't a bad game, if you want mostly hidden object scenes. Some items are incredibly small which makes it difficult to recognize, and there is a misclick penalty of 20 seconds added to the clock. I loved the optional hint games and found myself using a hint just so it would be available for me, enjoy! Rated 2 out of 5 by Coosto from DO NOT BUY THIS!!! I have owned this game for a long time and was so frustrated with it. I never got past the first, section the objects to small and the scenes are so far away from the items they are very difficult to see on a monitor screen. The timed object finds are stupid considering the above. To me it seems like the Developers blow the scene up, place articles in it and then shrink them down again. Finding an elephant under a blade of grass is not good programming. Rated 1 out of 5 by donnafischer from Waste of Time Love HOG, but this is a complete pixel hunt!!! Tiny, tiny objects to find and items listed as optional aren't optional. Don't waste your time and money on this one! !